Has anybody tried Write or Die? (http://writeordie.com/buy/ ) It seems like a sure-fire way for me to totally freeze up and be unable to write. 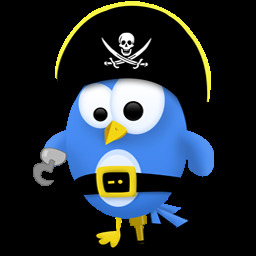 Cute Twitter pirate!!! Must. Have. Also, interesting links, especially the imposter article. Agreed, Jen--I've definitely been disappointed on multiple occasions when I've gone back to my Twitter feed to look for a link I posted and found it had evaporated.